"I've been defending my right to stand up against someone who wants to pervert the truth." That's a powerful quote from Rachel Weisz in Denial, one of the best films of the year. The film is based on the book History on Trial: My Day in Court with a Holocaust Denier by Deborah E. Lipstadt. Weisz portrays Lipstadt, a historian at Emory University in Atlanta in 1994. During an event where she is speaking, Lipstadt is confronted by noted Holocaust denier David Irving (played by Timothy Spall), who says that the reason Lipstadt doesn't debate with Holocaust deniers is that she can't because she could learn some "facts". Two years later, Lipstadt is sued in London by Irving for libel, claiming that Lipstadt's labeling of Irving as a "falsifier of truth" in her 1993 book Denying the Holocaust is untrue. Irving files the lawsuit in London because unlike the United States, where the libel laws state that the accuser must prove the accused were libelous, the United Kingdom's libel laws state the exact opposite: the accused must prove that the accuser's accusations are untrue. 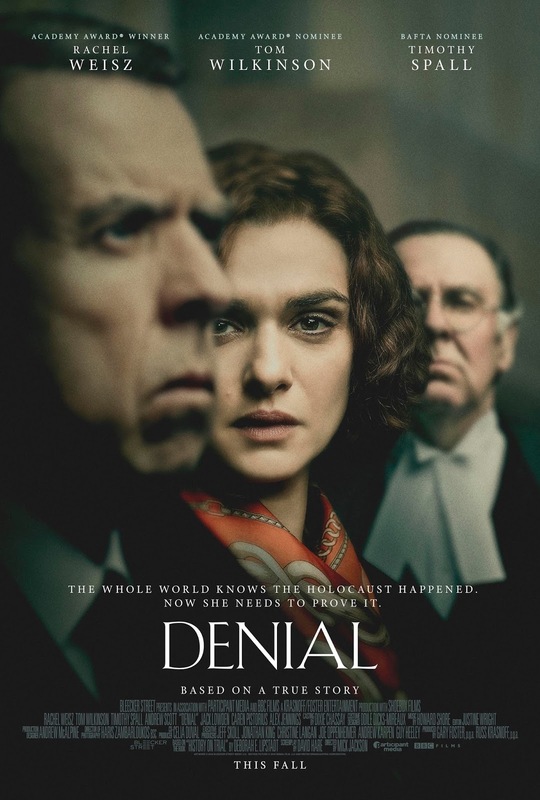 Now, Lipstadt, along with her legal team, including Richard Rampton (played by Tom Wilkinson) & Anthony Julius (played by Andrew Scott) must prove that Irving was falsifying the truth. The cast was excellent, especially Wilkinson, who is one of my 3 favorite actors of all time, & Spall, who is one of the best British actors of his generation. The direction from Mick Jackson is excellent, along with David Hare's screenplay. And Howard Shore's film score is amazing. This is definitely one of the most important films of the year.